A Honest to Goodness Plea from a Malaysian. I read this with a total 110% agreement with the writer (and thousands, perhaps millions other Malaysians), though, I admit I do not have the courage to address this openly as he did. A call for help asking those in power to stop the power struggle and focus on the people and the economy. While the whole world is in a state of panic trying hard to revive the economy, our local newspapers, are reporting about how we are better off than other countries and would be immune to this international crisis just shows that we, or should I say our leaders, are in a state of denial. By not accepting the fact that our beloved country could be seriously effected by the ecomomic turmoil, the priority was incorrectly placed … ecomomic distress was pushed aside for political struggle. En. Anas Zubedy … I salute you. The open letter was loud and clear. Please stop the power chase, call for a truce and focus on the economy. 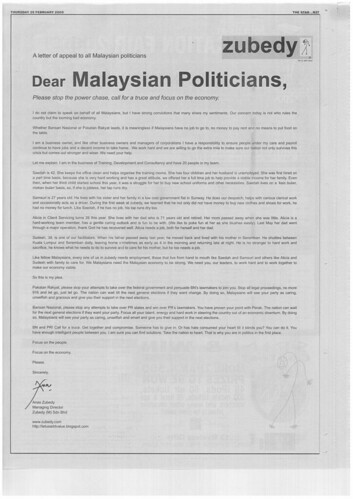 I do not claim to speak on behalf of all Malaysians, but I have strong convictions that many share my sentiments. Our concern today is not who rules the country or heads the state governments but the looming bad economy. Whether Barisan Nasional or Pakatan Rakyat leads, it is meaningless if Malaysians have no job to go to, no money to pay rent and no means to put food on the table. I am a business owner, like other business owners and managers of corporations I have a responsibility to ensure people under my care and payroll continue to have jobs and a decent income to take home. We work hard and willing to go the extra mile to make sure our nation not only survive this crisis but come out stronger and wiser. We need your help. Let me explain. I am in the business of Training, Development and Consultancy and have 20 people in my team. Saedah is 42. She keeps the office clean and helps organise the training rooms. She has four children and her husband is unemployed. She was first hired on a part time basis, because she is very hard working and has a great attitude, we offered her a full time job to help provide a stable income for her family. Even then, when her third child started school this year, it was a struggle for her to buy new school uniforms and other necessities. Saedah lives on a ‘kais bulan, makan bulan’ basis, so, if she is jobless, her tap runs dry. Samsuri is 27 years old. He lives with his sister and her family in a low cost government flat in Sunway. He does our despatch, helps with various clerical works and occasionally acts as a driver. During the first week at zubedy, we learned that he not only did not have money to buy new clothes and shoes for work, he had no money for lunch. Like Saedah, if he has no job, his tap runs dry too. Alicia in Client Servicing turns 26 this year. She lives with her dad who is 71 years old and retired. Her mom passed away when she was little. Alicia is a hard-working team member, has a gentle caring outlook and fun to be with. (We like to poke fun at her as she blushes easily). Last May her dad went through a major operation, thank God he has recovered well. Alicia needs a job, both for herself and her dad. Sudesh, 38, is one of our facilitators. When his father passed away last year, he moved back and lives with his mother in Seremban. He shuttles between Kuala Lumpur and Seremban daily, leaving home sometimes as early as 4 in the morning and returning late at night. He is no stranger to hard work and sacrifice, he knows what he needs to do to survive and to care for his mother, but he too needs a job. Like fellow Malaysians, every one of us in zubedy needs employment, those that live from hand to mouth like Saedah and Samsuri and others like Alicia and Sudesh with family to care for. We Malaysians need the Malaysian economy to be strong. We need you, our leaders, to work hard and to work together to make our economy viable. So this is my plea. Pakatan Rakyat, please stop your attempts to take over the federal government and persuade BN’s lawmakers to join you. Stop all legal proceedings, no more 916 and let go, just let go. The nation can wait till the next general elections if they want change. By doing so, Malaysians will see your party as caring, unselfish and gracious and give you their support in the next elections. Barisan Nasional, please stop any attempts to take over PR states and win over PR’s lawmakers. You have proven your point with Perak. The nation can wait for the next general elections if they want your party. Focus all your talent, energy and hard work in steering the country out of an economic downturn. By doing so, Malaysians will see your party as caring, unselfish and smart and give you their support in the next elections. BN and PR! Call for a truce. Get together and compromise. Someone has to give in. Or has hate consumed your heart till it blinds you? You can do it. You have enough intelligent people between you. I am sure you can find solutions. Take the nation to heart. That is why you are in politics in the first place. I’m having some issues with the previous theme, namely the archive page. The theme will list down my posting for the whole year. I posted quite a number of posts in December and the loading of the archive page takes a long time. It’s a pity, because I really like the theme … three column, magazine style page set up. Ahhh … what to do. No point keeping something that did not work for me. So, it’s time to change. For the record, this was how my main page looked like. Like I mentioned in my earlier post … The health of a nation depends on consumer confidence and consumer spending. Based on this report by The Star Online, it seems spending is a thing Malaysian economy need not worry about, at least for this moment. Eventhough quite a number of respondents are spending less, consumer confidence on the economy is strong. Only 22percent of Malaysian surveyed believes that the economy is going downhill compared to over 60percent of Americans and Japanese. That’s how confident they are … which is, in a way, good. Malaysians seems to be wary of the economic situation, but not drastically reducing their spending enough to hurt the economy too much. Supermarkets, Hypermarkets, shopping malls, all are still choked with people with bags of stuffs they purchased. They are still confident to go out shopping, maybe buying cheaper, value for money stuffs … but the spending still goes on. Whether the spending is good and confidence is high, however, saving a little for rainy days is always a good idea. This would mean lower fuel prices in the near future. But then, I asked myself, how or why did the price of oil dropped so much after going up so high. A few months ago, the price of oil was near the $150 region (I can’t recall the exact figure) and I was made to belive that there was not enough oil to go around. As demand exceeds supply, the price of the fossil fuel skyrocketed. Now, OPEC countries already cut down their daily production, still the price of oil goes down. I am thinking now, what happened to all the demand? The high demand that caused the sharp increase in oil prices earlier this year. It looks like there are less people wanting to buy oil, or they just can’t afford the high oil prices anymore. And. that thought worries me. I didn’t know the Touch n Go (TnG) Card has an expiry date either. I still have RM5 or so left in my TnG card and have not used it for quite a long time. I agree with CS Tan who posted his gripe on The Star newspaper yesterday. It’s very unfair to just take our money just because we did not use it for a long period of time. I’ll try to reload my TnG card and check if mine will reload with out any hiccups … but first, I got to look for that darn thing! I WENT to the Touch & Go (T&G) hub at KL Sentral to have my T&G card renewed. At the centre, I was told that the card had not expired but was deactivated as the card had not been used for more than a year. Once the card is deactivated, the user has to pay RM5 to have it activated. What is the rationale for Touch & Go Sdn Bhd to deactivate a user’s card just because the user has not used it for a year? Please bear in mind that any amount remaining in the card is fully paid for by the cardholder and the cardholder should have the absolute right to decide when to use it. Even a bank card takes seven years before an account becomes dormant. It is another good example of unfair trade practice by a company given the exclusive right by the Government. Lately bio diesel seems to be discussed a lot as an alternative to petroleum based fuel, both as a cleaner fuel alternative and one solution to reduce the world’s dependency on fossil fuels. Now, another alternative to protect our vehicle engines. Engine oil from cow fat? That’s something to think about. Autoblog highlighted the G-Oil recently. I wonder if prices for beef and other meats will increase or fall. Will the livestock industry grow larger just to get fat to replace petroleum lubricant. If that is so, the world supply of meat would go up, and, now, with the population being more health conscious, people is consuming less meat. There’d be an oversupply of meat and meat products. Simple economics says as demand falls and supply rises, prices would definetely fall. What do you think?